If you’ve ever fancied your hand at canoeing, in one of its many forms, we hope the Club will have something to offer you. We are a small, friendly, mixed club of enthusiastic canoeists, of all abilities, ages and interests mainly based in the London area. Membership is open to members of CSSC Sports and Leisure. This means that now MOST PUBLIC SECTOR EMPLOYEES ARE ELIGIBLE TO JOIN our canoe club when they join CSSC. Membership is no longer restricted to civil servants. The cost of membership of the Canoe Club for the remainder of 2018 is £15 and annual membership of CSSC is £47.40 (£42.66 for retired people). We meet weekly, and also have a programme of weekend trips, both locally and throughout the UK, as well as holidays abroad. Our current interests are touring, white water and sea kayaking. For newcomers, this site aims to give you an introduction to the Club, and what we get up to; tell you how to contact us for more details, to join etc. 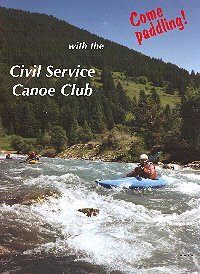 For members, the site aims to provide a useful reference source – for the latest Calendar information, Club rules, forms etc, plus links to useful web sites etc, including information on canoeing elsewhere in the UK, and on other sports and leisure activities available in the Civil Service. To become a member of the club you must also join (or already be a member of) CSSC Sports and Leisure (CSSC)*. *Anyone who is an employee in the public sector or of Royal Mail, BT, or companies carrying out ex-civil service work; or is a past employee of one of these organisations who is retired on pension is eligible to join CSSC direct. If you aren’t in any of those categories (for example you are not in employment, are self-employed, or work in the private or voluntary sector) you can join CSSC by being nominated by a friend or relation who is an existing member. During the autumn & winter Tuesday evening sessions take place at the Porchester Centre in Bayswater. For a taste of what goes on see- http://www.youtube.com/watch?v=hdN_o5UBpPw The 2018 winter sessions have now finished and are expected to start again in the autumn. Click the link above for the Port of London Authority’s recreational users website. (The PLA are in charge of the Thames between Teddington and the sea). Among other things there is an interesting video on rowing (includes paddling) through Central London. There is also a section specifically on Canoeing. The club has a small library of paddling books available for members to borrow. Most of the books are latest editions, including a number of Franco Fererro’s excellent Pesda Press titles, Olli Grau’s “White Water kayaking” and Gordon Brown’s “Sea Kayaking” to name just a few. The book list can be found on the members’ forum in the “General Discussion and Social Stuff” section. Members are welcome to suggest additional books and DVDs for the library. Loans or donations of paddling books which you no longer need are also very welcome.